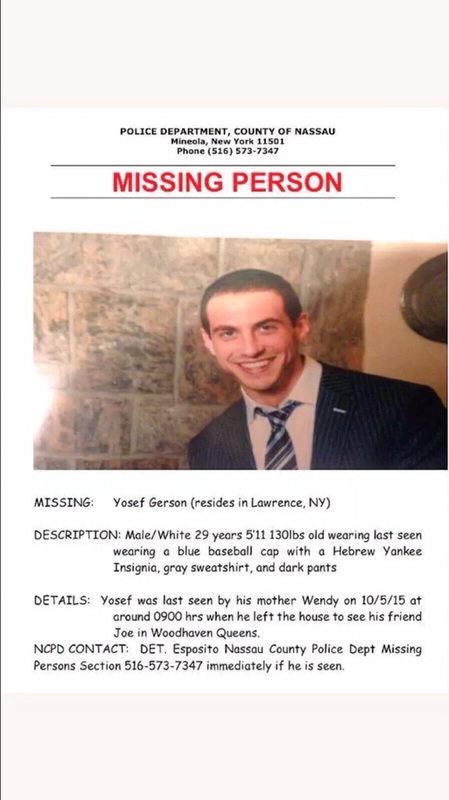 As is widely known, Yossi Gerson of Lawrence has now been missing for approximately 3 days. There has been an exhaustive search effort led by the Nassau County Missing Persons Squad, as well as the NYPD, to track and chase down any leads as to his whereabouts. Hundreds of volunteers including Shomrim, Hatzalah and friends searched for Yossi throughout the night but to no avail. A group of family friends has anonymously stepped forward and are now offering a $20,000 reward to anybody that can lead the police to the location and/or exact current whereabouts of Yossi. The Gersons are increasingly desperate to bring Yossi home safely and are now asking the media, their friends and family to please forward and share their heartfelt plea. There isn't much to say other than we are heartbroken. Our dear Yossi has vanished without a trace and we are asking and begging everyone everywhere to be our eyes and ears in the hopes that somebody has seen something. Whether you are in the Five Towns, Queens, Brooklyn or beyond, we ask you to share this information with anyone that you can. Yossi needs to be found quickly so he can get the proper medical care from his doctors and resume what had been a wonderful and successful medical school path. We ask you to respect the privacy of our family during this difficult time and we continue to have endless thanks to the hundreds of incredible heroes who continue to do everything they can to bring our Yossi home safely. Please continue to daven for Yosef Yechiyeh ben Devorah. IF ANYONE HAS ANY INFORMATION THAT CAN POTENTIALLY ASSIST US, PLEASE CALL OR TEXT THE SPECIAL HOTLINE AT 516-341-2360.